Navigation links on this page lead to several sources of interesting detail about Florham, first a Gilded Age estate and now a University campus. "A History of the Estate" is a text summary originally prepared by the Friends of Florham. The "Historical Timeline" is an interactive feature researched and designed as an honors project by a group of students. The "Mansion Audio Tour," also developed by a group of students, uses your smartphone to lead a walking tour of Hennessy Hall and its surroundings. The first episode of the public television series "Treasures of New Jersey" is a 30 minute video of the history of the Florham estate, leading up to its acquisition by Fairleigh Dickinson University. There are over 2,500 undergraduates and 900 graduate students attending the Florham Campus of FDU. Minority students comprise about 15% of the student population. Sports include Men's Division III programs in baseball, basketball, cross-country, football, golf, lacrosse, soccer, swimming and tennis; Women's Division III programs in basketball, cross-country, field hockey, golf, lacrosse, soccer, softball, swimming, tennis and volleyball; and Intramural Sports in aerobics, basketball, bowling, flag football, golf, karate, raquetball, softball, street hockey, tennis, Timex fitness week and volleyball. Four out of every five freshmen live in campus housing. First-year students generally are assigned housing in the Twomblies, two traditional-style residence halls with double rooms and a common bath. Upper-division students live in The Village, featuring apartment-style suites, or the Park Avenue and Rutherford Residence Halls. The Academic Support Center is housed in the residence hall complex, offering easy access to free tutoring, word processing support and special seminars. Campus activities include an active Greek community with national social fraternities and sororities, as well as a national service fraternity. The campus theatre produces student-written and -directed plays as well as student productions of major plays. FDU's Florham Campus is in Morris County, New Jersey, bridging the towns of Florham Park and Madison. The campus consists of 178 acres, part of Florham, a former country estate of early 20th-century socialites Florence Vanderbilt and Hamilton Twombly. Florham is a contraction of the first names of the couple. FDU has owned the campus since 1958. FDU Florham is primarily a residential campus, supported by a strong student life program. It boasts active fraternities and sororities, diverse student activities, and dynamic Division III and intramural athletics programs. Resident students are joined in class by undergraduate commuters and by adult, graduate, and certificate students, utilizing first-class educational resources either retrofitted into the campus' distinctive and appealing original buildings, or newly built especially in the most recent decades. The landscape was planned by Frederick Law Olmsted, who is renowned as the designer of New York City's Central Park. The surviving principal buildings, designed in Georgian style by the firm McKim, Mead, & White in the 1890s, have been adapted for educational uses. 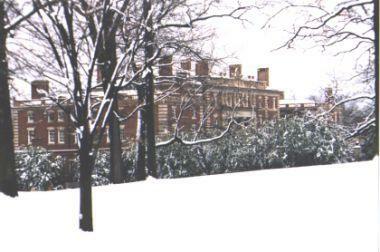 The 100-room mansion Hennessy Hall, centerpiece of the campus, is a work of Stanford White; it is a replica of a wing in King Henry VIII's Hampton Court. Most of its interior decorations (such as staircases and fireplaces) are in Italian marble, worked by craftsmen brought from the same country. In addition to classrooms and offices, Hennessy Hall holds Hartman Lounge -- the chestnut-paneled former billiard room -- and the Lenfell Hall drawing room. The campus library includes the sunny Orangerie, which originally provided the Florham estate with fresh citrus fruit through much of the year. The science building was adapted from the former garage and stables of the estate. The campus lies on a picturesque ridge, the terminal moraine of the last ice age. 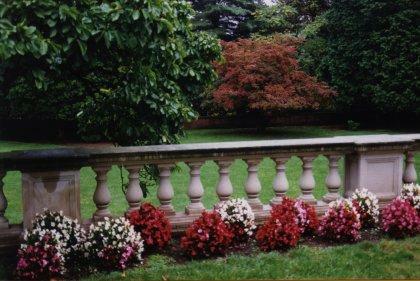 A diverse collection of specimen trees adds interest and beauty to the scenery. A good number of large White Oaks, some more than 150 years old, shade some areas, and "Fossil Tree Hill" has fine specimens of the Ginko and the Dawn Redwood (Metasequoia). Wildlife is protected on the grounds, and deer, wild turkey, and particularly groundhogs are frequently seen. Over 100 species of birds have been listed for the campus.